PC and Mac games download - Family and Kids Games, Free On Line Games Download. Start your adventure on the floating Dinosaur Island where you will help a tyrannosaurus collect lost eggs. Connect as many matching eggs together as you can to clear the board. Keep an eye out for various dinosaur eggs that can help you on your family-friendly adventure! Crazy Eggs is a fun game for the household.You can play this game together with your family, and challenge them to a game of logic, precision and speed! 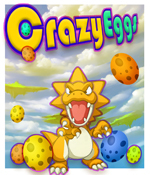 Get Crazy Eggs for Free Now!